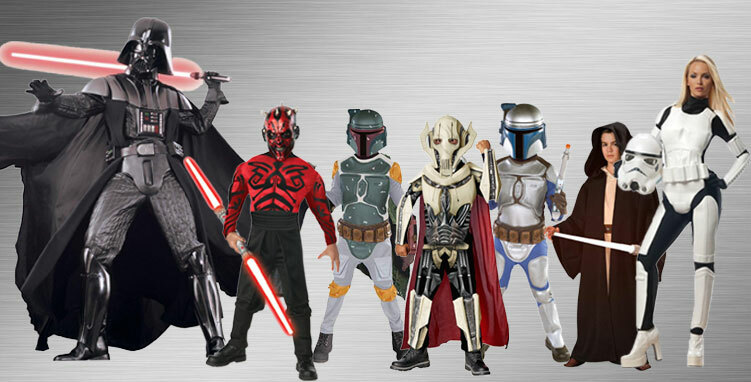 The bad guys are ready to take charge this Halloween when you get costumes from the Villains Costumes you see here! You can find villains from places like Star Wars, superhero brands such as Marvel and DC Comics, Disney movies, animated television shows, and more! There are evil looks for kids and adults, as well as accessories for the perfect Halloween costume! Every hero needs a villain. Without an obstacle or challenge, some of our favorite stories wouldn't be nearly as thrilling. There wouldn't be any crime for Batman to fight in Gotham, any intergalactic battles in Star Wars, and without Ursula, Ariel wouldn't have legs for venturing onto dry land. While they may not be the good guys, these slippery villains sure know how to put on a good show. Whether they are casting curses, concocting potions or causing mayhem in the streets, villains know how to get your heart racing and your blood pumping. If you are feeling a little wicked or if you want to give your friends a fright, a villain costume is the perfect attire for your next event. Don an elaborate costume and get in character. You will be slithering around the party, keeping people on their toes – just try to avoid your arch-enemy! Join the army to hunt down Luke Skywalker in this stormtrooper suit fitted for women. Grab your blaster gun and begin the hunt! As one of the elite soldiers in the galaxy, you will be ready to enforce the new order wherever you go. "These aren't the droids we're looking for. You can go about your business." As one of the most feared villains in the entire galaxy, Darth Vader demands respect with an imposing presence. Get ready to take down the Jedi Order and fight for the dark side as the ultimate villain. Whether you believe the softer side of her back story or you see her as the horned villain looking for revenge, Maleficent is a force to be reckoned with. Don her sleek dress and elaborate headdress, and be sure to watch out for those pesky fairies that always seem to get in the way. "But before the sun sets on her 16th birthday, she shall prick her finger—on the spindle of a spinning wheel!" By the Joker's side, Harley Quinn is completely devoted to him. From the day she met him at the Arkham Asylum, her life turned from doctor to patient and she never went back. With her wild, unpredictable nature, she wreaks havoc throughout Gotham. "Everything just like you said, except I hung the guy upside down so he sees the little frowns as little smiles." Completely unhinged and dangerously sadistic, the Joker is always looking for a new devious prank. His warped sense of humor and psychotic tendencies make him one of Batman's greatest enemies. "Jack? Jack is dead, my friend. You can call me Joker. And as you can see, I'm a lot happier." After developing his own intelligence and rebelling against his creator, Hank Pym, Ultron has become the antithesis to The Avengers. Made from the metal alloy adamantium, he feels invincible and ready to take on any foe no matter how big or powerful. "You want to protect the world, but you don't want it to change. You're all puppets, tangled in strings." What is more imposing than a life-sized super villain? An entire group of life-sized super villains! Whether you are lurking in a dark corner or standing proud in the middle of the room – your bold attitude and deceptive ways will keep everyone guessing. Get into character with a group of villains from one movie or span across an entire series, like all of the Disney movie villains. Superheroes run in packs, so you will need a gang of misfits to take on your enemies. Recruit your friends and family members to the join dark side and start planning your mischievous plot to take over the party. First it is the playlist, next it is the world! A battle of the beasts in the age of technology. 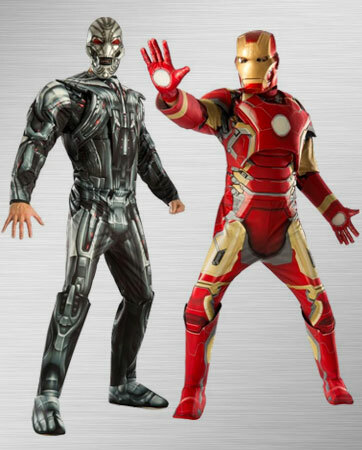 With his high-tech suit, Iron Man is a match for Ultron, but he doesn't have the ruthless nature that Ultron has. Show up to your next party in style as these metallic mega men and get ready for a fight of the ages. After spending his childhood in the hellish prison of Pena Duro in South America, Bane emerges with superhuman strength and and a keen intelligence that challenges Batman on many levels. 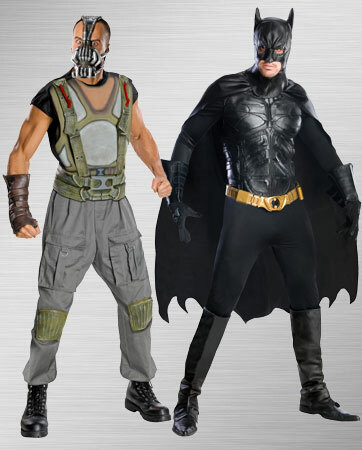 These two foes make the perfect dueling costumes for your next big event. 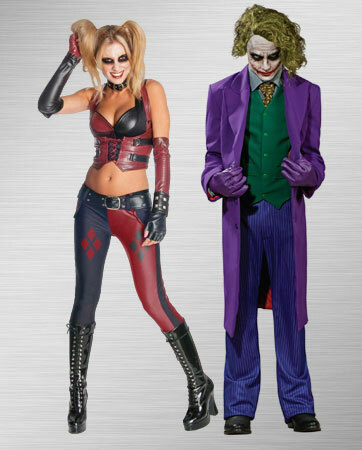 Showcase your mad love with this twisted couples costume. Harley Quinn and the Joker work side by side to wreak havoc and mayhem on the city of Gotham, and they get a kick out of doing it. Show up to your next costume party arm in arm with your villainous love. A super-villain is not complete without his army. 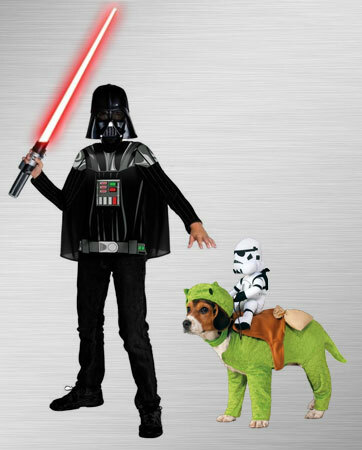 Pair your little one with your four-legged family member for a Darth Vader and Dewback trooper combination. The Dewback rider will follow the Dark Lord around the party, like the loyal trooper that it is. You can't partially commit to the dark side. You are either in 100 percent, or not at all. There is no turning back, in other words, so give it everything you have. You will turn heads from all across the galaxy in this Stormtrooper suit. Give your costume the ultimate treatment with a plastic Stormtrooper helmet that offers a little extra height, a two-piece mask, a black body-hugging jumpsuit, sturdy plastic PVC molded armor and a utility belt. This officially Licensed Star Wars Costume is the real deal and any droid will be able to tell that they should steer clear of you unless they want to be zapped into smithereens. There must have been some black magic involved in getting this effortless costume to look so good. The wickedly stylish black gown is complete with devious fairy wings and laced arms that your teen will love to wear. And she wouldn’t be the all-powerful Maleficent without her ominous horns. Whether she is wielding hexes all night or on the hunt for Sleeping Beauty, your little Maleficent will look stunning in this ultimate costume for whatever party she attends. Complete the authentic Maleficent look with a staff, black tights and black child boots. Ordinary makeup won’t cut it for an extraordinarily villainous costume. An amazing costume is necessary to look the part, but in order to be convincing, you need to go the extra mile with costume makeup as well. You will look just like the animation with these remarkable makeup tips from expert Bethany. Cruella is a true terror whose greed and lack of empathy cannot be matched with a mask.